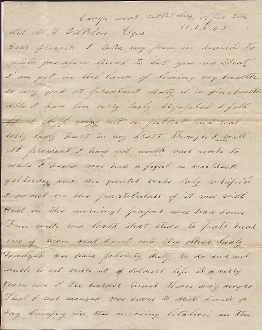 "...I have been very badly crippled. I fell off a bluff going out on picket and was very badly hurt in my breast...we had a fight at Deer Creek yesterday... the Yankees were badly repulsed...we had some fun with two boats that tried to pass near. One of them was sunk and the other badly damaged. We have plenty duty to do and not much to eat...a soldier's life is a very hard one...we have to drill twice a day...we had marching orders for Charleston...R.H.Paquinett."